I have used the circuit below in my SB-310 receiver rebuild for both the first and second mixers with minor component value changes for the different frequencies. Decoupling values are typical for the HF bands but if operation is required at much lower frequencies then the values should be increased. With careful layout the balance control and the 20p trimmer can give as much as 40dB of signal / IF suppression. The number of turns for transformers T1 and T2 will be determined by the particular application but in all cases the push-pull windings must be bifilar wound to help with balance. 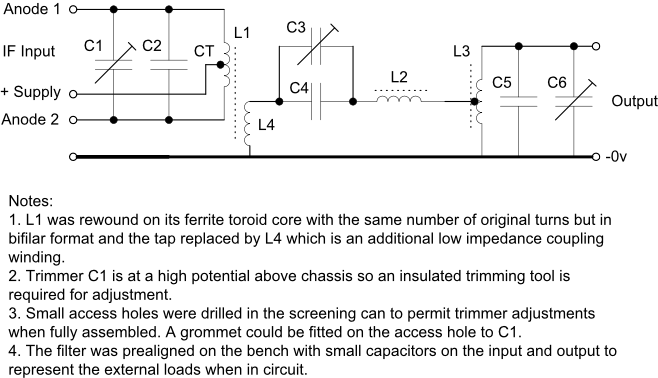 See item 7 in section 1 of Valve Circuits for more details of the band oscillator which includes T1. The SB310 has two mixers. The first one converts each selected band band to a tunable IF of 8.395 - 8.895MHz using the band oscillator and the wide band filter shown immediately below connected instead of T2 above. The second mixer converts the tunable IF using the LMO to a fixed IF of 3.395MHz using T2 as shown above. T2 primary resonates at 3.395MHz and the secondary winding provides a match to the 2000 ohm impedance of the mode filters. I have developed an improved version of this filter for use with a balanced valve mixer which can be seen here.